YVCS Families, Get Connected Here! We use a school management software database program that integrates the administration, classroom and home. Teachers enter lesson plans, homework and grades on RenWeb and have the ability to communicate with parents via email. This program also generates progress reports, report cards and transcripts. We are also using RenWeb for Online Admissions and Online Enrollment. Parents can secure a password online and use the site at home, work or on a smart phone via RenWeb’s App to see their student’s grades, homework, and email messages to teachers and use the family directory to contact other families. These are just a few of the many uses of the program and it comes at no charge to the parents. Please visit RenWeb.com to see it for yourself or click here for the mobile version of ParentsWeb. *Please note that when re-enrolling through RenWeb, you must use a computer. It will not allow you to complete the enrollment process with a phone or tablet. AmazonSmile is a simple and automatic way for you to support our school every time you shop, at no cost to you. By shopping at smile.amazon.com, you get the exact same pricing and selections as Amazon.com, and Amazon donates a portion of your purchase price to our school. Box Top Program & Class Competition!!! We are doing a class competition this year. The class to bring in the most Box Tops by May 15, 2019 will get an epic class party! There’s still opportunity to earn us bonus Box Tops through the Box Tops Bonus App. You’ll see what items offer bonus Box Tops as well as get access to coupons for items that have Box Tops. Easily download the Box Tops Bonus App onto your mobile device to get started. You'll need to create an account/sign up and select "Ygnacio Valley Christian School Concord, CA 94521" as the school your supporting under the "My Profile" tab. Easy and automatic Way to support our School ! eScrip is a program that allows participating stores to make a donation to our school when you shop using your registered rewards or credit/debit cards, at no cost to you. There are many merchants that participate, such as Lucky, Food Maxx, Save Mart, Draegers Market, Lunardi’s, Lucille’s Smokehouse BBQ, and more. A comprehensive learning and character-building environment takes more than classes, books and studying. We look to provide a rich extra-curricular life on the campus. The arts, music, spiritual life, athletics and social activities enrich the lives and community of the students and faculty. The faculty have a wide and varied background in areas and interests beyond their academic areas that they bring to the leadership of the many aspects of school life in which the students participate. All students are encouraged to find the particular area where they can develop their gifts and unique talents, and experience the joy of sharing them with others. Please use a black permanent marker to write student's name or initials on everything. In our handbook you’ll find information regarding our purpose and values, admissions, procedures and general school rules, our art programs, spiritual life on campus, standards for behavior and academics, and school contacts. If you have any questions regarding information in this handbook, please contact our school office. Teachers and Staff make the determination as to whether or not appearance is meeting the dress code. Students who are not appropriately dressed will be given a warning. 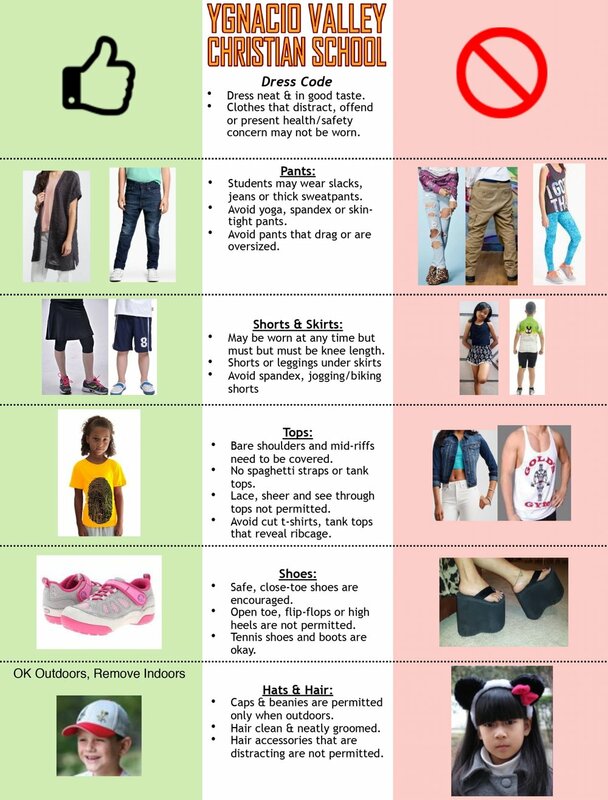 Students who repeatedly violate the dress code will have to wear cover provided by the parents or staff in order to go to class. Welcome to our resource to connect our grandparents and alumni. If you’re interested in becoming involved in YVCS and participating in this wonderful ministry, we invite you to contact us and let us know what you’d like to be involved in. We will mail and/or email you relevant upcoming events, school news and other school related items of interest. Alumni, join our contact list if you wish to be included in future school announcements, mailings and event notifications. We’d love it if you’d update your information with us and tell us what you have been up to since we saw you last! Connect if you wish to be included in future school announcements, mailings and event notifications. We are excited to count on your support! Please Add Me to Your School Contact List! If you're a grandparent to a current student, who is your grandchild?